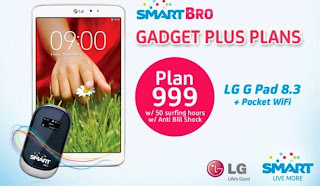 Smart's Gadget Plus Plan now reaches LG tablet by adding the G Pad 8.3 to the plan portfolio. One of the best tablet in the market today with superb specs that can match up those leading brands in terms of functions and features. After offering Samsung Galaxy Tab 3 on the same postpaid plan, Smart quickly grab this latest tab of LG for their subscribers to experience on latest and hot gadget in town. The good news is it comes with free Smart Bro pocket Wi-Fi for only 999 pesos a month. Aside from free portable pocket Wi-Fi, you also get a free 50 hours of internet surfing that you can use for your LG G Pad tablet or other Wi-Fi capable devices. You can connect your laptop and smartphones together as you can connect up to five gadgets in one device. You'll be enjoying the high speed internet on your Smart Bro using you 50 hours free internet surfing every months. 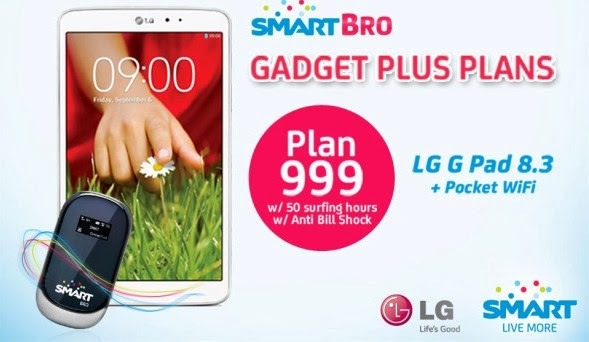 As part of Smart and LG promotions of this tablet they raffled up LG G Pad 8.3 via Twitter by simply follow LG Philippines and tweet about this tablet with follow hashtag #SmartBroLGGPad and #LGGPadPH. Unfortunately this promo was ended last December 9, if you want to join Smart and LG's upcoming promos just follow their Twitter and Facebook account for updates. For those who want to get LG V500 G Pad 8.3 tablet via prepaid or cash payment your take it home for the price of 16,990 pesos. Released first week of December and set to be available soon on your nearest LG store, resellers and Smart Wireless Center. i am on my 7th month of my smart bro plan 999 (canopy), can i switch to this new promotion smart bro plan 999 with gadget plus plans?